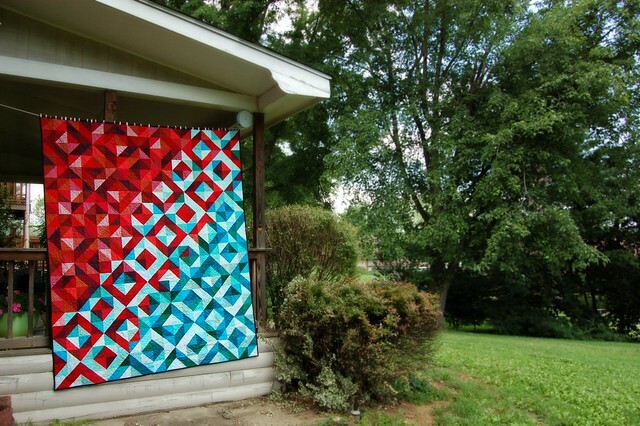 This is possibly my favorite quilt, and it’s certainly the one that has had the most “how can I make one” questions as I was making it, so I thought I’d share some tips on how to make your own. First, the story behind it: This quilt is a gift for my best friend Kim, who is engaged to Matt. I wanted to make a quilt for them that would illustrate the blending of two hearts, two lives and two families. I named it Lava Meets Sea, because when lava hits the sea it makes rock, a strong foundation. To start yours, decide on the colors you’d like to use. To make it easy on myself, I bought bundles of fat quarters of coordinating reds and blues. Both are Colorstory Fat Quarter Bundles by Robert Kaufman. The red is called Hot Spice, the blue is Grecian Waters. 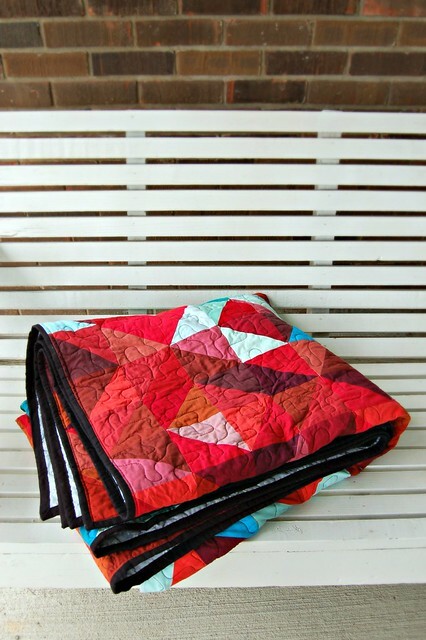 This gives you a wide range of lights and darks in each color to work with, but keep in mind that this quilt is based on value (the depth of color) as much as it is on color itself. Be sure when choosing your colors and making your blocks that you continue the pattern of dark and light even as you change colors. With the bundles of colors I chose, the red bundle is darker than the blue, so notice how the colors meet in the middle of the quilt. 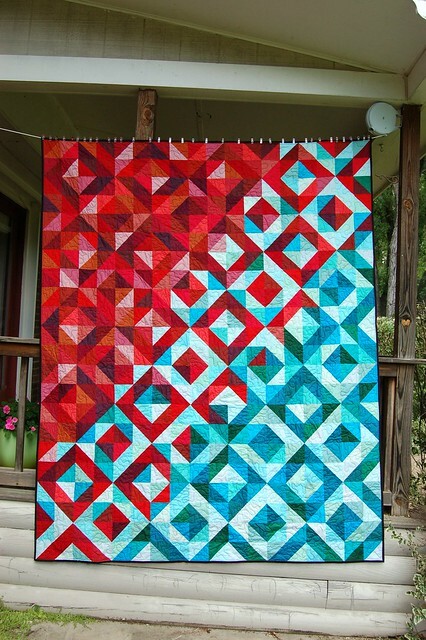 The darker shades of the red are used with the paler shades of blue to keep the dark and light values moving through the center of the quilt where the colors meet. It is very important that you not rely on the different colors to create the effect, make sure you’re keeping the dark and light values even through the color changes. That might be easier to see from this photo where I was first laying out blocks. Here’s my super fancy chart. Notice that this was not meant to be shared with the public, as I even wrote my optometrist appointment reminder at the top of the page. *Sigh* This makes a generous lap sized quilt, big enough to share for a nap on the couch. If you follow my chart, you’ll want to cut 201 red squares and 195 blue squares for a total of 396 squares. 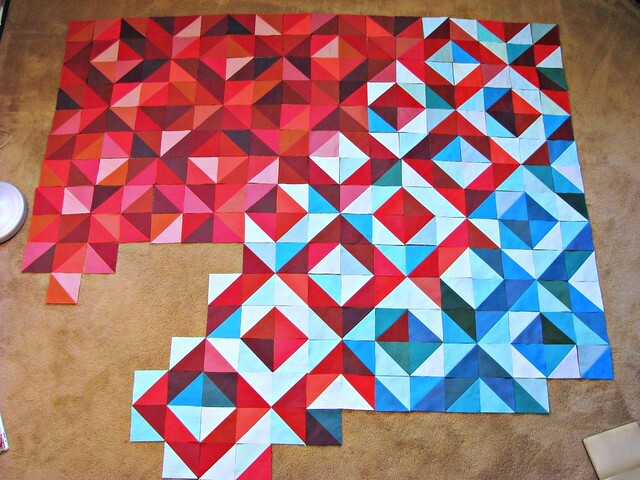 Then you’ll want to make 127 red blocks, 121 blue blocks and 148 mixed blocks for the middle. (I’m not sure that I kept completely to the chart, but it is helpful when you first start laying out the blocks.) 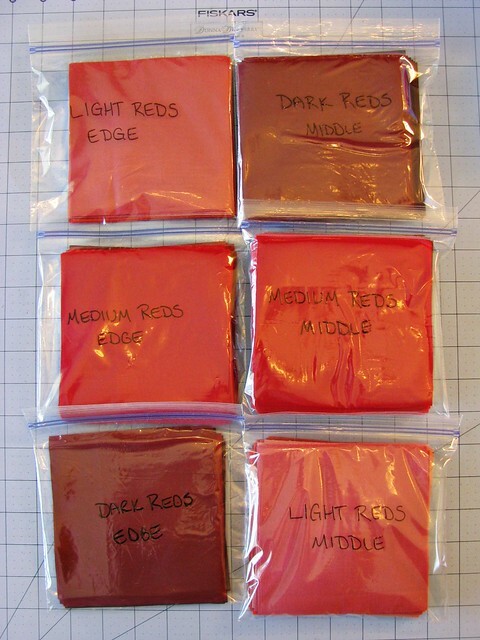 You can see how I separated my colors into two stacks each of dark, medium and light, one for the “solid” red (or blue) and another for the mixed (middle) area. 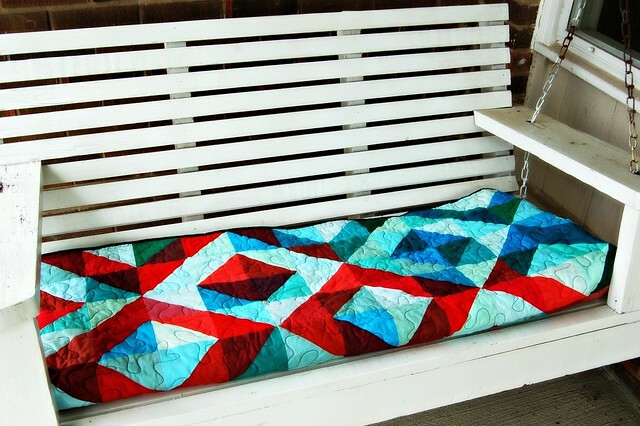 The blocks for this quilt are the most simple blocks you can make, half square triangles. Even if you’re new to sewing, with just a little practice you can make perfect blocks. There’s a full tutorial here if you need to learn the method. (I started with five inch squares just as in the tutorial.) The tutorial will explain to separate colors into dark, medium and light and then mix them together to get the contrast you need for each side of the block. By looking at the photos here, you should be able to lay out the blocks to form the diamond pattern that flows across the quilt. Remember, if you’ve made half square triangles with contrasting values, you can create many different designs just by changing the direction of the blocks. Play around with them and you may find a design you like more than this one! I chose a plain black binding, something that wouldn’t distract from the strong pattern of the quilt. Thank you for posting! I absolutely love this design, along with everyone else on this post! 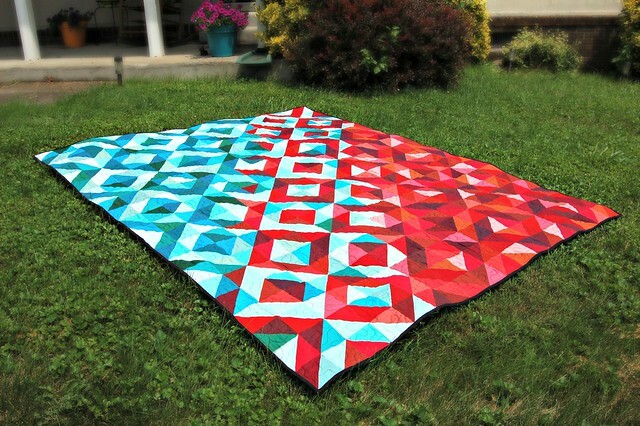 I am hoping to tackle this project soon – I am a beginner so I am going to take it nice and slow :) I was wondering if you had any tips on number of squares for a larger quilt about 90″ x 94″ ? Thank you! Hi Emma! I hesitate to give measurements to fit a particular bed, but I will point you in the direction of a great post to help you figure it out: http://crazymomquilts.blogspot.com/2009/12/how-to-calculate-quilt-measurements.html I’d also suggest you make it just a bit bigger than you think you might need, since it will shrink a little in the wash, and a quilt that’s a little longer is not a tragedy but a quilt that’s too short kind of is. 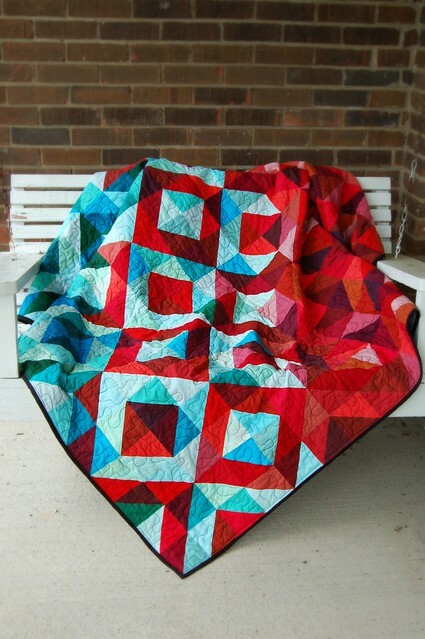 I love the quilt and its dramatic colors. I have found all the fabrics that were contained in the Hot Spice and Grecian Waters bundles and purchased them from Fat Quarter Bundles online shop. Please clarify for me the color matching: when creating the blue squares am I using the dark blue with the light blue colors? Same for the red, dark red with light red? 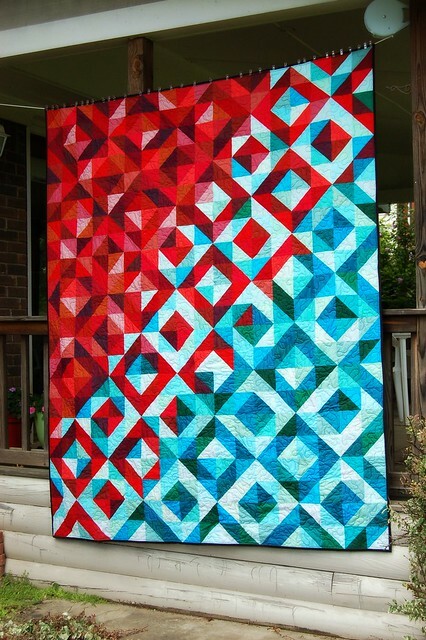 Then for the mixed squares am I to use the medium red and medium blue colors together? I am making this for my son whom is a citizen in three countries that all have a combination of red/white, red/white/blue colors on their flags. I’m putting the pattern on a piece of graph paper and I was wondering how big the blocks are? And what is the final measurement of the quilt? (The way you made it) thank you, this is a brilliant quilt! Hi Lila! I think I made the blocks 5″, but it’s been a couple years so my memory may be faulty. It was a nap/lap quilt not intended to fit a bed, so it didn’t matter what size it ended up. You can make the blocks any size you want or need to get the size quilt you need. Here’s a great site to help with sizing quilts: http://crazymomquilts.blogspot.com/2009/12/how-to-calculate-quilt-measurements.html I hope it helps! I have finally made this quilt. I’m so excited that it is done. I couldn’t quite get the fabric packs you used so I went and picked each color. I think I used upwards of 50 some FQ’s of different colors. I’m so happy with the result. Thank you for sharing your wonderful quilt design. Kathy, that turned out so perfectly! I love it, and you did an amazing job picking your fabrics, too! You SHOULD be happy with it, it’s fantastic! Thanks so much for sharing your link to it, too, it’s great to see it! How many FQ bundles of each color does it take for lap size? Hi, Tammy! No, sorry, I don’t have a written pattern. I think grays would be lovely with pretty much any color, grays are a favorite of mine! You’ll just want to be sure to have a range of lights and darks, and make sure that you can carry on the pattern of light and dark as you transition between your grays and your second color. The blocks themselves are very easy. Just follow the layout from the photos, and the pattern should make sense to you as it builds. Good luck with it! Hi Eryn! 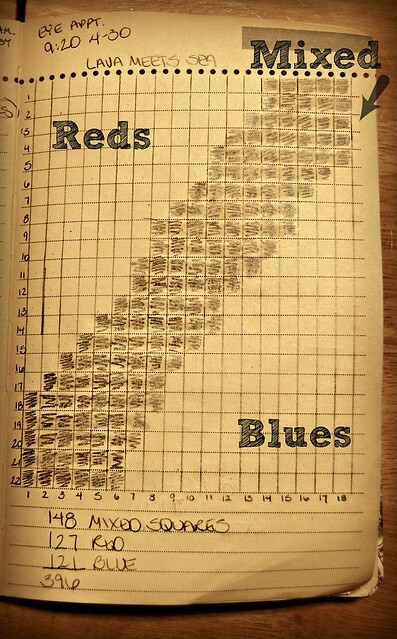 The blues I used had 23 different shades/fat quarters, or 5.75 yards of fabric, and the red had 21, or 5.25 yards. Both were Colorstory Fat Quarter Bundles by Robert Kaufman. The red is called Hot Spice, the blue is Grecian Waters. I tried to post a comment a while back, but I don’t think it made it across the wire. I linked back to this post. If there is anything else you want me to add, you can email me. adreamandastitch (at) gmail (dot) com. I love your quilt, Jen! I left you a comment on your post, but wanted to respond here, too. You used scraps!! I thought that was a great look, and you must have CRATES of scraps! I hope your son cherishes it for decades to come, and I hope you’re proud of it. Thank you for sharing it with me! I am working on this project and I was just wondering if there was a pattern to which colors matched with which? Did you just make sure that a light and dark were in the same black and when putting the blocks together you just made sure 2 of the same colors weren’t right next to each other? Hi Chelsey! It’s just random, but you’re right, I did try to make sure that two of the exact same shade weren’t right next to each other. Just keep the light/dark pattern going and enjoy watching it grow!